Caution: I have had one of the craziest weeks of my life – so I apologize if this post is disjointed or rambling. The next binding that I am going to share is actually the first binding project that was assigned in the second year. Students at NBSS are not given a binding to do for the first couple of months of their second year, so that there is no distraction from practicing gold tooling. It’s probably a wise choice – as I was looking for anything else to work on after the first couple of days of tooling. The millimeter binding is a very modern and elegant adaptation of the paper case binding, well suited to thin volumes. It is also a logical next step in the curriculum because it is so similar to the leather bindings done in the first year (here). I’m going to discuss two variations: the millimeter binding and the Rubow binding. According to John Hyltoft, former Head of Conservation for the Smithsonian Institute Libraries, the millimeter binding style was developed by the Danish binder Henrik Park during WWII. At a time when luxury items like leather were at a premium, there was a place for finely bound volumes that used leather as sparingly as possible. These bindings are characterized by leather (or parchment or even cloth) that covers the spine and extends about a millimeter onto the boards. Small “hidden” or “semi-hidden” corners are also quite popular. Park’s book from 1949, titled Moderne Danske Bindtyper, is a short volume with nice photographs of several millimeter binding styles, including detailed photos of a variety of corner and headcap styles. Other variations on the millimeter include one by August Sandgren, in which small strips of leather appear at only the head and tail of the spine and extend a millimeter onto the boards (Park, Bindtype I). Two variations that are not pictured in Park, that are probably more modern adaptations include a kind of T shape in leather at the head of the spine, with small arms going onto the boards, and doing a full strip of leather along the fore-edges of the boards instead of corners. The “Bind-O-Rama” from 2005 (found here) has images of a range of bindings that encompass the variations on the style. Don Rash’s book is definitely my favorite of them. The “Rubow” binding, supposedly suggested by Jorn Rubow (maybe this Jorn Rubow?) features leather all along the head and tail edges of the boards. 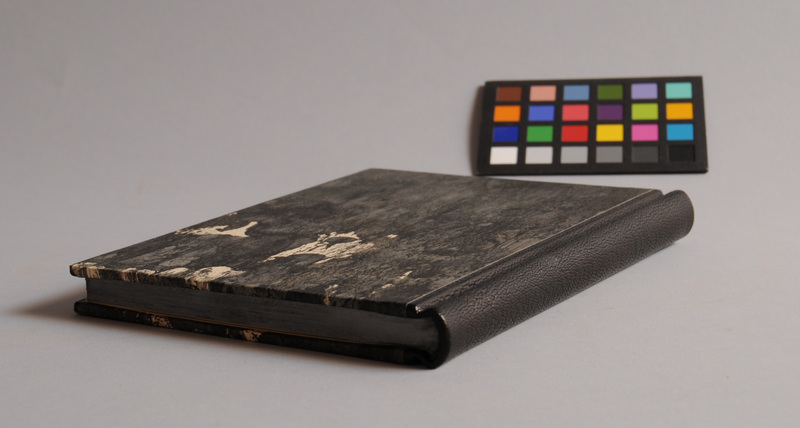 Park’s description of this binding, “papirbind med slidskinner”, fittingly translates to paper binding with wear rails. 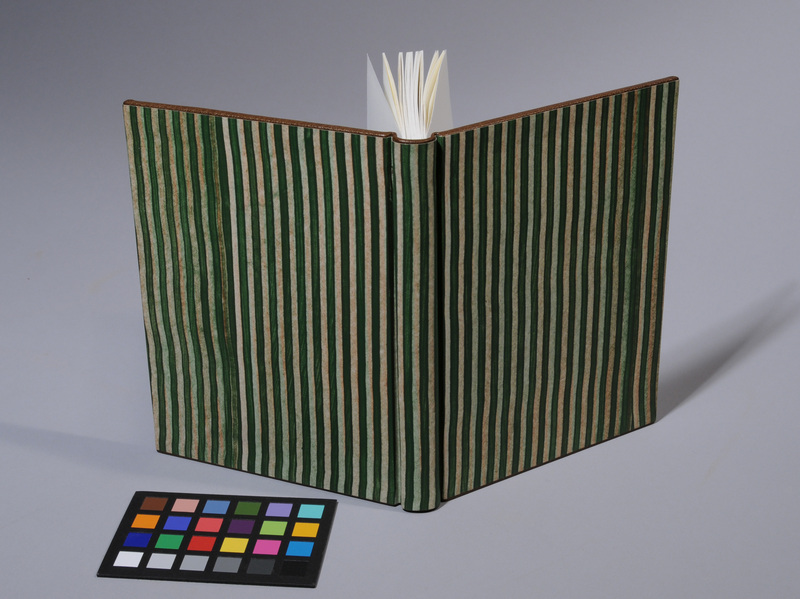 Some common features of the books include a single-folio endsheet reinforced with a Japanese paper or textile hinge, sewing on flattened cords, 90 degree shoulders with open joints, rolled leather or cloth endbands, and edge decoration (Riley, 2006; Verheyen, 2005). In reality, these are an economical form of fine binding. 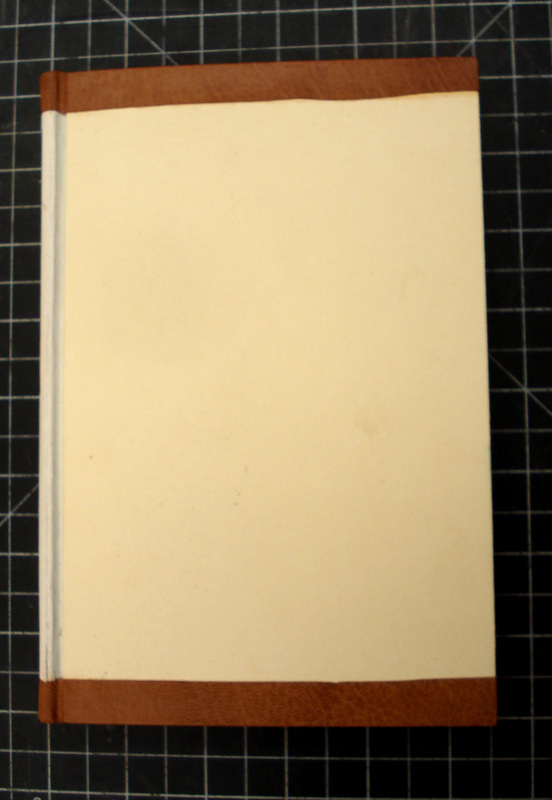 The literature presents two methods for doing this binding: either as an “on-set boards” binding in which the boards are attached to a waste sheet built into the endpapers before covering (Riley’s method), or as a simple case structure that is covered before attaching it to the bookblock (Verheyen’s method). The endsheet construction will depend upon the method of assembly. For the on-set boards version, the endsheet is composed of a single folio of decorative paper with a 2cm strip of mull tipped to the outer edge. A folio of plain paper is then wrapped around, forming a plain flyleaf and wastesheet. This whole assembly is then folded 5mm away from the edge to make a hook, which is wrapped around the first or last section of the text (Riley, 2006, p. 10). The endsheet for the case version is either a single folio of decorative paper tipped to the first or last section of the text or a double folio that is sewn on (Verheyen, 2005, p. 25). Regardless of the number of folios, Verheyen advocates adding a guard of Japanese paper or thin cloth around the first section and endsheet. The forwarding of the book is basically a more refined version of what I have described in the past concerning case bindings or on-set boards bindings. I will note, however that according to Riley, it is only the head edges of these books that are typically trimmed and decorated (p. 12). Solid color, sprinkling, graphite or gilding are options for edge treatment. I did a solid graphite edge for one and a graphite and gauffered edge for another. If endbands are present in millimeter bindings, they are almost always rolled leather endbands. The spine lining is done much the same way that I have described before – patch lining and sanding to get a very smooth, but rigid, spine. 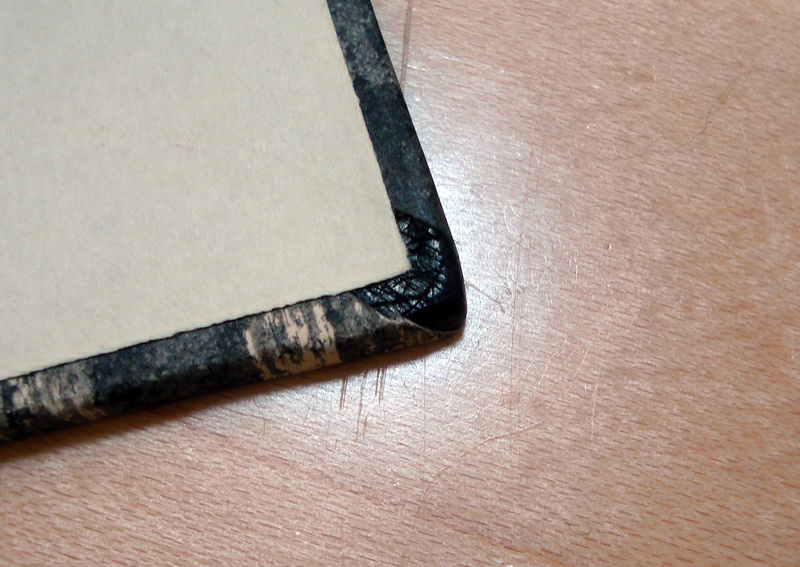 The leather covering is done first, and, for this style of binding to look right, the edges of the leather cannot be visible under the paper covering. Once the leather is covered over, any sudden changes in transition from leather to board surface will be very apparent and look sloppy. There are two methods for dealing with the thickness of the leather. The first is to flat pare the leather, cover, then in-fill the remaining space on the boards before covering with decorative paper (Verheyen, p. 28). 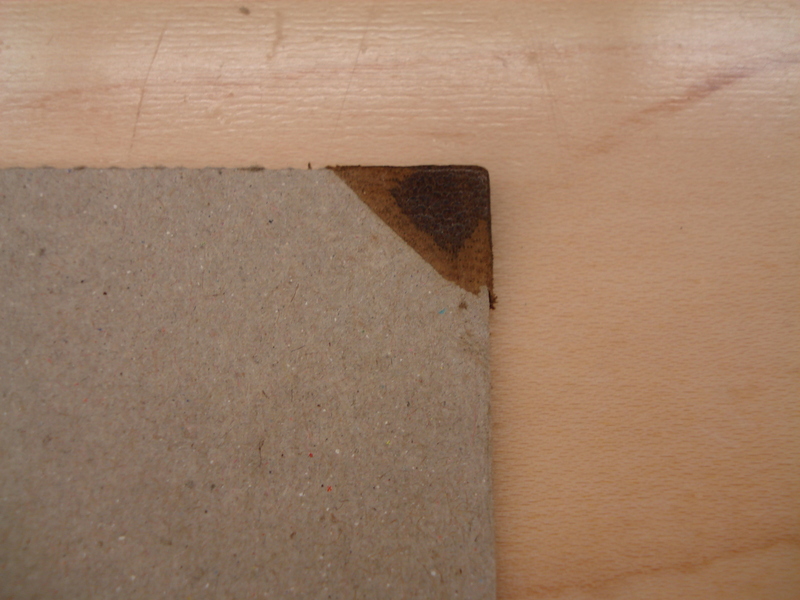 The second method is to edge pare the leather, cover, then further pare and sand the leather to achieve a long, gradual bevel onto the board surface (Riley, p. 15). Regardless of how you deal with the leather, it is pared quite thin (0.5mm). Covering is done in the usual way with paste. I found the Rubow covering to be quite challenging, however, because so little leather is holding it onto the boards while you are doing the turn-ins and headcaps. If following Riley’s method of beveling the leather, the millimeter of skin that will be exposed is marked out with dividers and the edges further pared at a shallow angle with the knife. The edge is also sanded to get a very smooth surface. The leather patches at the corners are done at this point and sanded smooth in the same way. To finish, the boards are covered in decorative paper and the endsheets pasted down. Paste papers are quite common in the examples that I’ve seen. 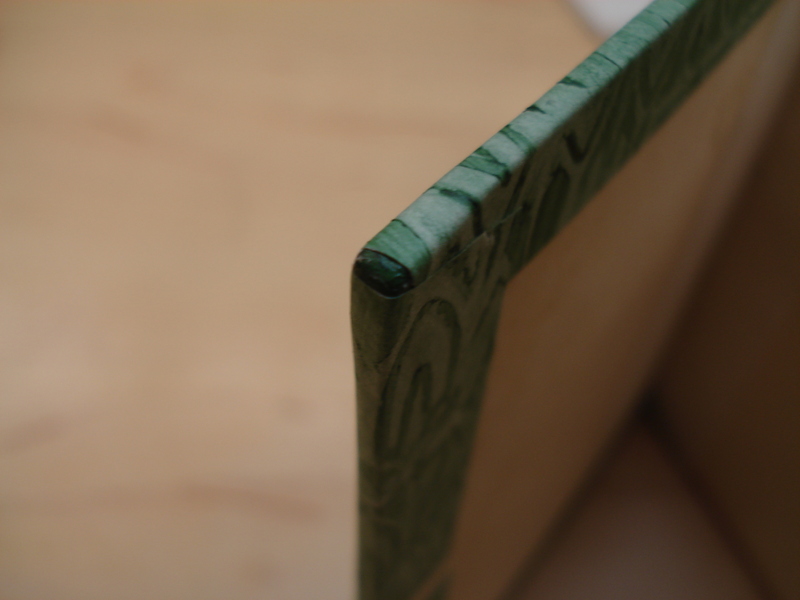 This binding style is actually quite fun to do and the results look very refined. I highly recommend Riley and Verheyen’s articles for step by step instructions. John Hyltoft also demonstrated this binding at the GBW Standards conference in 1995. You can purchase a video of that demonstration here. Application deadlines are starting to loom and I have to sort out what I’m doing after I graduate in June – but I will try to keep posting the vast array of projects that I have to share on a regular basis. Here is a short list of what is in the queue: Carolingian binding, atlas and album structures, book action/sewing support models, limp leather, and springbacks. Park, H. (1950). Modern Danish Bookbindings. Copenhagen, Anker Kysters. Riley, D. (2006). The Millimetre Binding: Danish economic structure. Bookbinder, 20, 9-17. Verheyen, P. D. (2005). 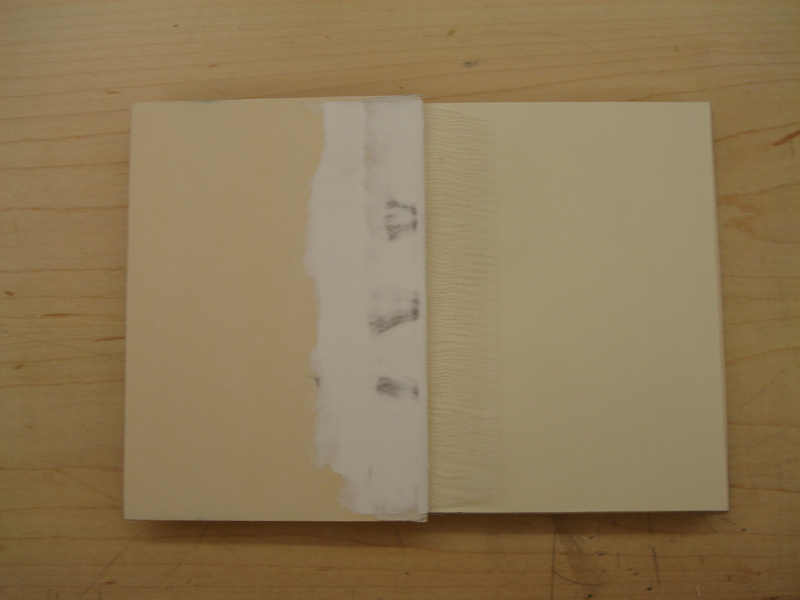 “Millimeter Binding / Edelpappband” The Bonefolder: an e-journal for the bookbinder and book artist, 1(2), 25-29. Another excellent post, thank you. And now for a little (nationalist) needling. I remember conversations with Mark Andersson and others about what you refer to as the Rubow and we know in Gernany as the “edelpappband.” Whether in boards or as a case binding, they are visually identical. It is the developed during WW II part that I would like to point out that Collin describes this style of binding in his Pressbengel (translated as The Bone Folder) from 1922. In his case the material used was vellum, bit I have also seen examples using leather or cloth that predate that. The true Danish Millimeter is a different beast as you point out in your first example, backed as I learned in Ascona to 90 degrees… Done well, they are amazingly elegant. Key to their elegance in most cases are also the proportionately thin boards, going down to 40pt. For the smaller books these structures are ideal for this is no problem. Really looking forward to what you write about next. This is a great series. Thanks for the encouragement, Peter! Your mention of Collin’s earlier references to the style is appreciated – now that I think about it, it is only natural that some form of these bindings would have developed in Europe during the hyperinflation in the years before the war. It’s interesting that the board thickness will go down to 40pt. It seems like it would be quite difficult to form such a small shoulder evenly. I’ll have to give it a try! I really enjoy your blog and craftmanship – I’ve nominated you for the One Lovely Blog Award.